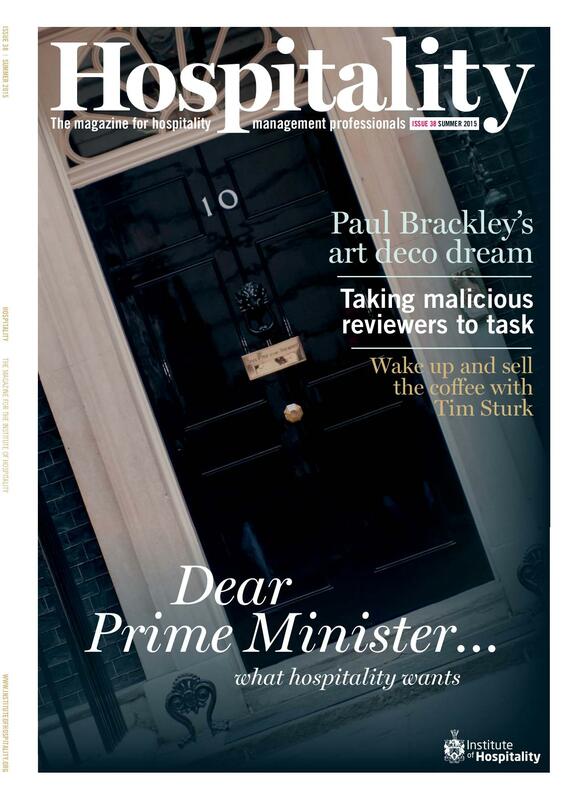 This magazine has highlighted a career in housekeeping as “the faster route into senior management (issue 33, Autumn 2011).” Are our future leaders really aware of the excellent opportunities available in housekeeping operations? Do they know enough about the department to allow them to practice and refine their managerial skills? Hospitality management degrees don’t seem to cover housekeeping to a great extent. Consequently, students seem to think that housekeeping is about toilet brushes, making beds and not much else. For hotel and housekeeping service providers, this presents a challenge. Where will our future housekeeping managers come from? Those in the profession highlight the diverse and international career opportunities available and they emphasise – usually with eyes shining with joy – that everyday is different and that they learn something new every day. How to get this across to students? Earlier this year I organised and chaired two housekeeping panel discussions, one at the Edge Hotel School in Colchester and one at Doncaster College to enable housekeeping professionals to get close to students and to challenge their perceptions. The panel of housekeeping professionals at the Edge Hotel School event consisted of committee members of the UK Housekeepers Association (UKHA) London & South East;and representatives from Omni Facilities Management; Brown’s Hotel, London; Coworth Park Ascot, Casna Group, and the Royal Household. The panel agreed that: “housekeeping has a huge impact on the people in the hotel, the quality of the guest experience and, ultimately, the bottom line.” The panel members emphasised how important housekeeping is to the success of any hotel business. The panel discussion at Doncaster College carried the title ‘Housekeeping? A Career!’ and representatives from Doncaster College, Stratford upon-Avon College, Holiday Inn Express Doncaster, Springboard, and Omni Facilities Management engaged in an hour-long discussion with over 40 students. By sharing their fascinating career stories, panel members highlighted the vast opportunities available in housekeeping all over the world. Both events engaged the students. The message was that to be a great GM you need to understand housekeeping since: “The hotel is housekeeping; it is the core of the hotel. If you are willing to be part of that team, you are at the heart of the hotel.” By describing the day-to-day work of housekeeping professionals, the panel members were able to profile the perfect housekeeper: “You have to be passionate about hospitality, have attention to details and be flexible, as curveballs get thrown at you all the time.” It became clear that managing a housekeeping operation requires a number of managerial skills: responsibility for a large team and management of a large amount of information. It is a diverse role. You are not deskbound. Everyday you can add value. 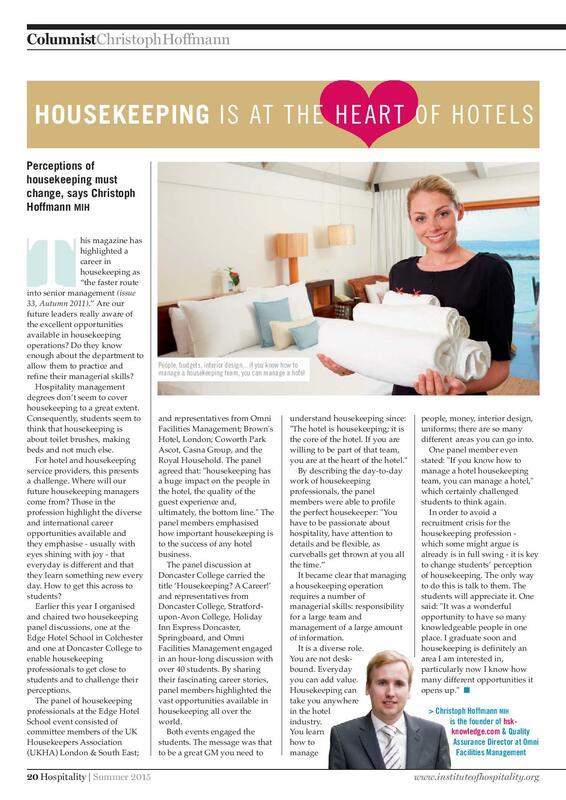 Housekeeping can take you anywhere in the hotel industry. You learn how to manage people, money, interior design, uniforms; there are so many different areas you can go into. One panel member even stated: “If you know how to manage a hotel housekeeping team, you can manage a hotel,” which certainly challenged students to think again. Download the origianl article here.